Imagine a single, working mother of a preschooler and a school-aged child. 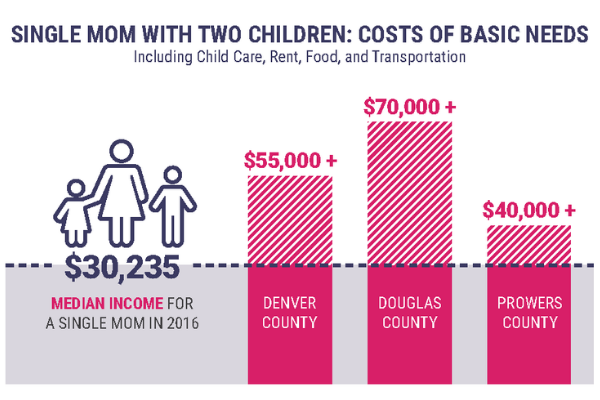 To cover the costs of basic needs, including child care, rent, food, and transportation, she must make over $55,000 in Denver County, over $70,000 in Douglas County, and over $40,000 in Prowers County. However, the median income for a single mom in Colorado in 2016 was $30,235, far below what’s needed to make ends meet. A small, unexpected change can have seismic consequences. A 10% increase in rent, a car that breaks down, or an aging parent who needs extra care and support, is enough to push her into debt and financial turmoil. Achieving economic security provides freedom from fear of an unanticipated expense, to make choices and progress, and to prepare for the future. The Women’s Foundation of Colorado knows that hardworking Colorado women of all backgrounds juggle many roles and responsibilities, professionally and personally. Women are business leaders and employees; mothers, sisters, and daughters; community leaders, role models, and advocates; caretakers and breadwinners. WFCO believes all women deserve respect, opportunity, and support. When economic opportunities improve for women, their families, communities, and the entire economy rise. Women reinvest their earnings into families and communities at higher rates than men. Companies with greater gender diversity have better financial performance. 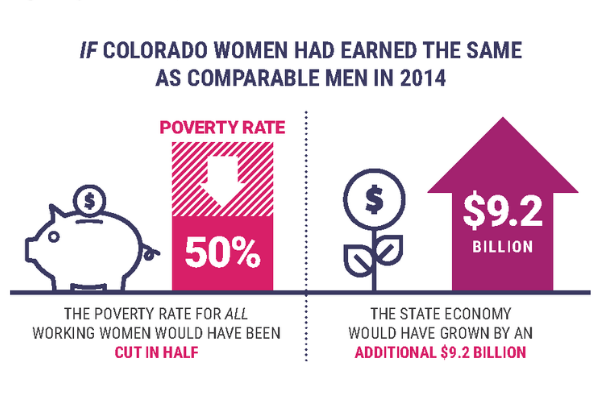 If Colorado women had earned the same as comparable men in 2014, the poverty rate for all working women would have been cut in half and the state economy would have grown by an additional $9.2 billion. Our state and our economy can be strengthened by advancing common-sense, practical policies that create opportunities for women to reach their full potential and remove the barriers standing in the way of their progress. One bill can positively or negatively impact hundreds of thousands of women and families statewide. Advance policies that put high-quality child care within reach for working families. Pursue policies that make work work for everyone, such as establishing systems for paid family and medical leave insurance for all workers and standards for earning paid sick time, raising wage standards, and prohibiting gender- and race-based discrimination. Strengthen policies that propel educational and professional opportunities for women. The Women's Foundation of Colorado is committed to advancing these priorities through our public policy work. And we invite and encourage all voters, elected officials, and candidates to consider these policy solutions, detailed in The Womanifesto, that will help women, and Colorado, thrive. We also encourage you to share The Womanifesto with your community and networks, as well as the elected officials who represent you at the local and state levels. How do you make your voice heard? Read our civic engagement guide. The Women’s Foundation of Colorado has not taken a position on any statewide or local measures that will appear on the November ballot. We hope voters will consider the issues and policy priorities in The Womanifesto when determining how they’ll vote.